Four Newbery winners are books of poetry. One, Karen Hesse’s Out of the Dust, is a novel in free verse and will be featured in a separate post. The other three are reviewed below. 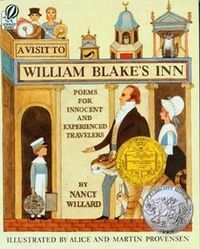 A Visit to William Blake’s Inn: Poems for Innocent and Experienced Travelers, by Nancy Williard (1982 Newbery), is an homage to William Blake, nature, imagination, and beauty (supported by Alice & Martin Provensen’s gorgeous illustrations). Some of the poems are too whimsical for my taste, but this book is aimed at younger rather than older readers. The poems follow a young boy’s visit to William Blake’s Inn [the real Blake (1757-1827) was a poet, artist, and printmaker, but never an innkeeper]. Blake’s guests include a tiger (of course), cat, rabbit, and cow, and these animals take essential roles throughout. The cow, for instance, sleeps on a cloud and then eats it for breakfast. There is little of Blake’s philosophy or mysticism here — none of his dark Satanic Mills — only his joy in all things natural. The nearest hint of Blake’s disgust at ignorance comes during a tour of the Milky Way. The rat, grumbling perhaps because Blake has given him iron shoes for the hike, fails to appreciate the beauty around him. While the others are all given stars at their journey’s end, the rat receives a handful of dirt. OK, I get it. Stop complaining. But I think the rat was set up. BTW, funny story here. Evidently one of Willard’s poems was taught in the UK and other parts of the English-speaking world as though it had been written by Blake! Read all about the error here. Joyful Noise: Poems for Two Voices, by Paul Fleischman (1989 Newbery) and illustrated by Eric Beddows, is about insects: grasshoppers, mayflies, moths, water striders, crickets, and others. Even book lice (don’t worry — these don’t bite humans; they feast on the mildew that grows on books kept in humid libraries; and hey! they’re related to the deathwatch beetle!) make an appearance. Fleischman celebrates the insect world with poems meant to be read aloud. At times the two voices are in unison, at other times they build a fugue of words, circling each other (much as moths circle bright lights) until they eventually land. The poems also follow the seasons, from the sap rising in the early spring (“Grasshoppers”) to the first killing frost (“Requiem”). The final poem is “Chrysalis Diary”, taking us through the winter. There is great humor in Fleischman’s poems: A moth woos a porch light with his serenade. A drone and queen bee’s duet contrasts the queen’s pampered life with the drone’s frenetic one (“busy as a bee” isn’t the half of it!). And the book lice meet by happenstance when one slips down a few shelves. Like Willard’s book, this one is aimed at younger readers. Good Masters! Sweet Ladies: Voices from a Medieval Village, by Laura Amy Schlitz (2008 Newbery), began as a set of monologues and dialogues for students studying the Middle Ages. So, as with all poetry, this collection is intended for performance; if you have suitable costumes and scenery, that’s a plus. The voices here are young inhabitants (ages 10-15) of an English town in 1255 (a handy map at the beginning shows each character’s location throughout the town). We hear from children who live in the manor, as well as poorer children — the blacksmith’s daughter, a shepherdess, a pilgrim, a half-wit. Schlitz hides nothing. We see the Shambles, where offal-producing workers (butchers, tanners, etc.) are located. We see poverty, death, fear, prejudice, ignorance. But there are also moments of joy. A sniggler’s daughter (sniggler is a great word — it’s someone who fishes for eels) calls herself lucky because she wasn’t drowned at birth. From that moment, her family’s luck changes for the better. Schlitz’s poetry and prose hold lively and earthy language (dung and stink everywhere), and it’s easy to see the appeal of these roles to students. Three roles are prose rather than poetry: Will the plowboy, Pask the runaway, and Nelly the sniggler. But throughout, you get a sense of a community where lives intersect. In one poem a lord’s daughter complains about an unprovoked mud-slinging attack, and in the next the mud-slinger provides her reasons for throwing that mud. Otho the miller’s son mentions the beatings his father gives him, and then Jack the half-wit tells how he befriends the unhappy Otho. Interrupting the monologues are occasional background pages on topics like pilgrimages, falconry, the Crusades, Jews, and agricultural practices. Footnotes explain medieval terms, and a bibliography points readers to further areas of exploration. This book is a great companion to other Newbery winners about the middle ages (too many to list here, but watch for future posts about them). Newbery Fun Facts: 1) Paul Fleischman’s father Sid Fleischman won the Newbery Medal in 1987. They’re the only parent-child team of double winners. 2) Willard’s book is the only Medal winner also to receive a Caldecott Honor for its illustrations. This entry was posted in Historical fiction, Newbery Award, Poetry and tagged Laura Amy Schlitz, Nancy Willard, Paul Fleischman. Bookmark the permalink.